A glance at the finger-length claws curling off the paws of a riled-up grizzly bear sow preceded a decision Noah Kolis wishes he had never had to make. “I remember glancing down at its claws, back up at its face and that’s when fight or flight kicked in,” Kolis said. In the days since he has gone over time and again what happened — and what he could have changed. On a cloudy afternoon in late May, Kolis was guiding three Chicago buddies on a bachelor party hike to some chimney rock formations. They started hiking from Kolis’ childhood home in Cora, near the road to Green River Lakes at the base of the Wind River Mountains. The 23-year-old Jackson resident had seen grizzlies there before but had never dealt with an angry ursine mom up close. Suddenly his dog was being chased and then, like that, he was staring down a bear and faced a decision: shoot or not. “I was just thinking, ‘Don’t make me do this, don’t make me do this,’” Kolis said. As he scanned the ground where the grizzly stood on all fours about a dozen feet away, the sight of the claws spurred the thought “Those will kill you.” His gut told him a second charge could be imminent. Adrenaline pumping, “my mind was quiet,” he said, as he then calmly pulled the trigger on his Smith & Wesson Model 460V revolver. The bullet struck the stationary bear in the cheek, and she fell. Potential harm to himself averted, Kolis started “cursing up a storm,” mad at the situation and himself, as the bloodied bruin rolled down a steep hillside in the Bridger-Teton National Forest’s Boulder Basin. He shot at least three more times to end the sow’s misery, knowing the gravity of what had just happened. Wyoming Game and Fish Department officials investigated the scene after the shooting but could not find the two cubs of the year that been with the approximately 7-year-old sow, which wore a tracking collar due to previous dustups with livestock. Kolis’ party heard the cubs calling for their mother about a half-hour after her demise, but neither youngster was seen again. Game and Fish investigators also cleared Kolis of wrongdoing. John Lund, the agency’s Pinedale regional wildlife supervisor, was among those who visited the site in the field. He said that although the case is still open, the state has made a preliminary finding. Kolis, who works as a Teton/Jackson County Recreation Center lifeguard, approached the News&Guide about the shooting, hoping it could be a lesson for others. His party was large and carried two canisters of bear spray, both recommended strategies for avoiding lethal encounters. But in other ways the group’s decisions likely contributed to the shooting that orphaned two young cubs. 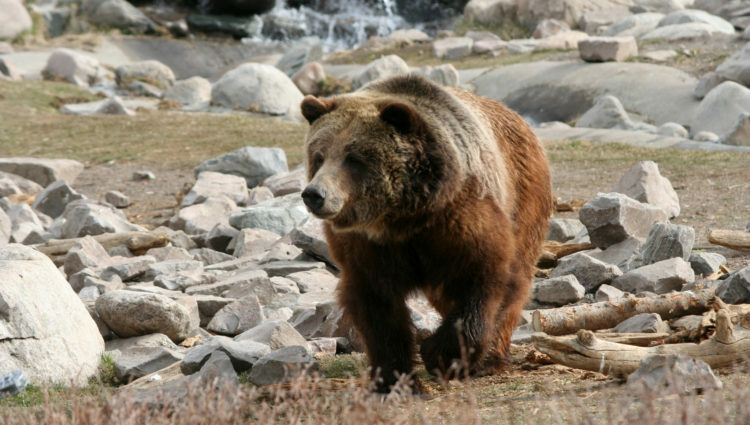 The bear’s fatal run-in with the group occurred around 2 p.m. Thursday, May 31, on a mostly cloudy day within a mile of where Kolis had twice seen grizzlies — his only two previous encounters, which happened six to eight years ago. The apex carnivores, protected by the Endangered Species Act until last year, began showing up in the Upper Green River drainage in the late 1990s, according to the News&Guide archives. Two decades later it’s a densely occupied area. A chronic summertime clash between grizzlies and cattle in the region attests to the abundance of bears. Kolis knew that. There have been grizzlies in his parents’ yard, snacking on raspberries, and he sees tracks routinely, including the same morning, left by a sow and two cubs. When the four-person bachelor party took off to trek into the Boulder Basin, just north of New Fork Lakes, they embarked by walking away from Kolis’ parents’ doorstep. Eventually they branched off a forest road off-trail. Scrambling upslope, the hikers had become strung out, with two people 50 yards ahead of the other pair. Kolis’ Chesapeake Bay retriever mix, Lily, had trotted ahead, and at one point he could see his pooch was intrigued by something. Her body language suggested it was a larger critter, like a moose or a horse. “I look up the slope a little bit and I see something moving, and I’m like, “Holy crap, that’s a bear,’” he said. They screamed at Lily, but not before she’d roamed within about 10 feet of the bears. It was too late. The sow momentary slipped behind a rock but then charged downhill at the dog like she had been shot out of a cannon. The rapidly descending grizzly caused the unarmed Midwestern groomsman who hiked alongside Kolis to bolt himself, among the No. 1 no-nos of what to do when a bear is charging. The group’s two cans of bear spray were both with the men who trailed 50 yards behind. Kolis knew better and stood his ground. His presence caused the bruin to swing in his direction, diverting from its downhill pursuit of Lily, who escaped with a sprained lower leg but nothing worse. Then the female grizzly stopped, at a distance investigators put at 10 to 15 feet, and Kolis fired. The whole sequence of events, from Lily’s approach to the first gunshot, consumed what Kolis guessed was 15 to 20 seconds. The “extremely close” proximity of the grizzly to Kolis was a factor in why the shooting was classified as self-defense, Game and Fish’s Lund said. Lund did not pass judgment on the role Lily may have played in triggering the attack, and he pointed out that there is no requirement to leash dogs in the area. “It’s always possible that they would have walked right up on the thing if the dog were not there,” Lund said. “We can’t speculate. We don’t know what would have happened if the dog wasn’t there. Steve Primm of People and Carnivores, a nonprofit that educates the public about coexisting with grizzlies, said the group appeared to have lacked preparation for hiking in grizzly country. The hikers should have rehearsed what to do and talked through different scenarios, he said. Giving in to the impulse to run could have been disastrous, he said, and the off-leash dog that didn’t recall immediately likely played a role in the deadly run-in, he said. Bear spray, he said, would have been “really, really effective” at the short distance, especially given that the grizzly wasn’t moving. Before the last day of May the largest thing he’d killed was a rabbit, struck accidentally while driving. He’s a believer in bear spray, and usually carries it. If he was reading the news reports about someone else shooting a grizzly, he too “would be one of those people” blasting decisions that were made. “You can say all you want about what you’d do in a hypothetical situation, but until you’re in that situation you don’t know what you’re going to do,” he said.